THOUGH the Grantham Canal is not yet restored there is still the opportunity to experience a cruise on the waterway. 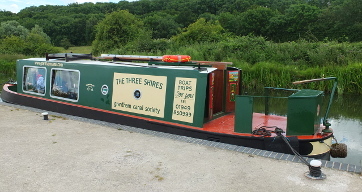 The Grantham Canal Society organises half hour cruises on its trip boat The Three Shires throughout the summer months from Lock 18 at Woolsthorpe by Belvoir. During May these operate from 10am to 4pm on Sunday 6th, Monday 7th, Sunday 27th and Monday 28th, giving the opportunity for visitors to experience a restored section of the waterway. Lock 18 is by the Dirty Duck pub, NG32 1PY. These are 'turn up and ride trips'.